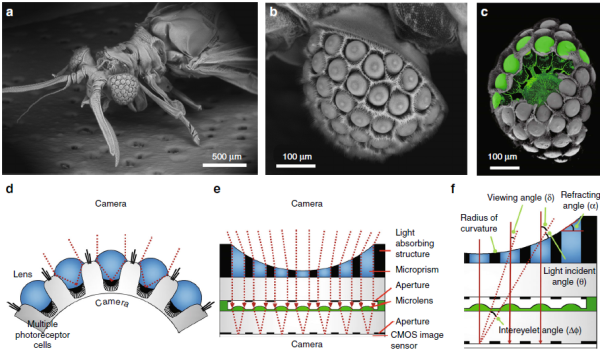 Researchers in Korea have developed an ultrathin digital camera that emulates the unique eyes of a wasp. The digital camera developed by the tram at KAIST offers a wide field of view and high resolution in a slimmer body compared to existing imaging systems. It is expected to support various applications, such as monitoring equipment, medical imaging devices, and mobile imaging systems. The camera is less than 2mm in thickness, emulates the eyes of the Xenos peckii by using dozens of microprism arrays and microlens arrays. A microprism and microlens pair form a channel and the light-absorbing medium between the channels reduces optical crosstalk. Each channel captures the partial image at slightly different orientation, and the retrieved partial images are combined into a single image, thereby ensuring a wide field of view and high resolution. “We have proposed a novel method of fabricating an ultrathin camera. As the first insect-inspired, ultrathin camera that integrates a microcamera on a conventional CMOS image sensor array, our study will have a significant impact in optics and related fields,” said research lead Professor Ki-Hun Jeong.